Vol. IX. - No. 22. Palmyra, N. Y., Tues., Feb. 14, 1832. Whole 438. Mormonism. -- This moral pest is increasing. We gather from the N. Y. papers that some miserable fanatics who profess the doctrines of that novel sect, have made a few converts in Pomfret, Chautauqua county, N. Y. One of their number died and the night after his burial, a party of "resurrection men" were disturbed while disinterring the deceased, and one of the offenders taken and bound over for trial -- The editor of the Censor gives a very flattering account of the intellectual endowments of the community in which he resides, when he says, the Mormonites have selected "a suitable field for operation, where nothing is too absurd to gain credence." Note 1: The Chautauqua County "editor" cited above, was Henry C. Frisbee, the founder of the Fredonia Censor, who, in his issue of Jan. 11, 1832, reported: "Some of the followers of Jo. Smith have recently commenced operations in this town... They had gained a few proselytes, and had the prospect of doing a fair business, when one of the principal of them was arrested in his career by the tyrant Death on Saturday last." The Mormon missionary, Elder Joseph H. Brackenbury was "the principal of them" mentioned in the died in Censor report -- he died in Pomfret township on Jan. 7, 1832. Brackenbury was perhaps the first LDS preacher to pass away while on a mission for the Church. Note 2: Since the Wayne Sentinel mentions reports of Mormon activities coming "from the N. Y. Papers," the other news item thus implicitly mentioned was probably the brief item published in the Buffalo Patriot of Jan. 17, 1832. In that account the Buffalo editor says of the Pomfret Mormons: "One of their number died, and the night after his burial, a party of "resurrection men" were disturbed while disinterring the deceased, and one of the offenders taken and bound over for trial." This brief mention of strange events in Chautauqua County was followed, on Jan. 25, 1832 by a more detailed account from editor Frisbee: "Died, in Pomfret on Saturday, 7th inst. Joseph H. Brackenbury, a 'Mormon Preacher.'... [who] professed to have power to heal the sick, and raise the dead... [The Mormons with] Brackenbury attempted also to heal him, and since his decease [sic - disease? ], to raise him from the dead." Note 3: The Sentinel, in its issue of Apr. 11, 1832 inadvertently passed along a second, garbled version of Brackenbury's death and subsequent grisly events, as copied from an erroneous article in the Vermont Burlington Sentinel. For more on the Mormon side of this strange story, see Gregory A. Prince's 1995 book, Power From on High, pp. 150-51. Vol. IV. Canandaigua, N. Y., March 14, 1832. No. 46. A "NAIL." -- F. Cowdery is making arrangements to establish an unshackled and independent press at Albion. He will commence at early canal navigation with a new establishment, under favorable auspices. Note: Evidently "favorable auspices" never came to editor Franklin Cowdery (the cousin of Oliver Cowdery), for he remained at Geneva for a few more months and never did start a new newspaper at Albion (the site of his previous publishing endeavor, the Newport Patriot.) Both Franklin and the people involved in the Ontario Phoenix were Anti-Masons. As such, Franklin would have most certainly known the Phoenix's previous editor, William W. Phelps -- since 1831 a Mormon and close associate of Oliver Cowdery. Vol. IX. - No. 30. Palmyra, N. Y., Wed., Apr. 11, 1832. Whole 446. Death of A Mormon Preacher. -- Died in Pomfret, Vt. on Saturday 7th inst. Joseph H. Brackenbury, a "Mormon Preacher." -- He recently emigrated from Ohio, in company with one or two individuals of the same society. They preached, exhorted, and with great zeal and apparent humility, attempted to propagate their doctrines. -- Two or three embraced their sentiments so far as to be baptized -- one a Free Will Baptist, and another a Presbyterian. In confirmation of their doctrine and divine mission, they professed to have power to heal the sick, and raise the dead. It is reported that they attempted twice without effect, to heal a Miss Nancy Johnson, made a cripple by falling from a horse. She was not healed for lack of faith; but started for Ohio with the Mormons to obtain more. -- The company of Brackenbury, attempted also to heal him, and since his decease, to raise him from the dead. We learn that the celebrated Mormonites, Mr. Smith and Elder Rigdon, have recently been tarred and feathered in Ohio, and that they have since left that state for Missouri. Note: This garbled account should be entirely ignored by the modern reader -- see the Wayne Sentinel of Feb. 14, 1832 and appended notes and links, for the correct version of Brackenbury's death. Vol. ? Penn-Yan, NY, April 11, 1832. No. ? Note: A similar article appeared in the Painesville Telegraph of Apr. 17, 1832. Vol. IX. - No. 31. Palmyra, N. Y., Wed., April 18, 1832. Whole 447. A Rochester paper mentions that Mormonism has taken "deep root" in a certain church in the town of Mendon, Monroe county. "The preacher says he shall never die, but be translated, after the manner of Enoch, and that in eighteen months Mormonism will be the prevailing religion, and that in five years, the wicked are to be swept from the face of the earth." Note: The original news report was filed by the Mormons' old nemesis, Abner Cole. Although there was no way of predicting the fact at the time, one of the new converts would become a future leader of importance among the LDS: Brigham Young. Vol. V. Canandaigua, N. Y., May 2, 1832. No. 1. TRIAL OF BRUCE AND WHITNEY. -- At the Circuit Court and Court of Oyer and Terminer, held at Lockport, Niagara county, on the second week in April last, Eli Bruce was convicted for contempt of court. In refusing to be sworn as a witness on the trial of Ezekiel Jewett, in June 1830, was sentenced to 2 months' imprisonment in the jail of that county, and fined the sum of $250 -- to stand committed until the fine be paid. John Whitney, for like offence, on the same trail, was also sentenced to two months' imprisonment, and fined $100. He had previously been sentenced by Judge Marcy, to pay a fine of $250. On the same trial, Orsamus Turner was arraigned on indictments pending against him for contempt of court, but swore off the trial, stating that Ezekiel Jewett was a material witness for defence, and that Jewett happened to be at Washington at that time. Note: One of these prisoners, Orsamus Turner, would later write an account of the origin of Mormonism. Turner had worked as a printer in Palmyra and climed to know some personal information about Oliver Cowdery, etc. Vol. V. Canandaigua, N. Y., May 23, 1832. No. 4. A "Mormonite" newspaper has been established at Independence, (Misso.) by W. W. Phelps, called the "Evening and Morning Star." In a postscript he says: "From this press may be expected, as soon as wisdom directs, many sacred records which have slept for ages." Vol. V. Canandaigua, N. Y., May 30, 1832. No. 5. As the forerunner of the night of the end, and the messenger of the day of redemption, the Star will borrow its light from the sacred sources, and be devoted to the Revelations of God as made known to his servants by the Holy Ghost, at sundry times since the creation of man, but more especially in these last days, for the restoration of the house of Israel. We rejoice much because God has been so mindful of his Promise, as again to send into this world the Holy Ghost, whereby we are enabled to know the right way to holiness; and, furthermore, to prove all doctrines, whether they be of God or man. For there can be but one, as Christ and the Father are one. All of us know, or ought to, that our Heavenly Father, out of all the peoples which he planted on the earth, chose but one people to whom he gave his Laws, his Revelations and his Commandments, and this was Jacob his chosen and Israel his elect. All know, too, or might, that for disobedience, or not keeping his commandments to do them, God had this people carried away captive into all countries, and scattered among all nations, but promised that he would gather them and bring them again unto their own lands; Then the land should yet yield its increase, and at that time he would take away the stony heart and give them a heart of flesh, and write his law in it, that all might know from him from the least of them to the greatest of them: -- So that knowledge of him might fill the whole earth, as the waters cover the sea. At which time it shall no more be said, The Lord liveth that brought up the children of Israel from the land of Egypt; but The Lord liveth that brought up the children of Israel from the land of the North, and from all the lands whither he had driven them. And it shall come to pass in the last days, the mountain of the Lord's house shall be established in the top of the mountains, and shall be exalted above the hills; and all nations shall flow unto it. And many people shall go and say, Come ye, and let us go to the mountain of the Lord, to the house of the God of Jacob; and he will teach us of his ways, and we will walk in his paths: for out of Zion shall go forth the law and the word of the Lord from Jerusalem. And it shall come to pass in that day, the Lord shall set his hand again the second time to recover the remnant of his people, which shall be left, from Assyria, and from Egypt, and from Pathros, and from Cush, and from Elam, and from Shinar, and from Hamath, and from the islands of the sea. And he shall set up an ensign for the nations, and shall assemble the outcasts of Israel, and gather together the dispersed of Judah from the four corners of the earth. Seeing these things so plainly foretold, we have great confidence in declaring to all flesh, that, not only the day but the hour is at hand for all to be fulfilled: when the earth shall be transfigured, and return to the same beauty and goodness, as at the morn of creation; when the righteous shall rise, and flow together, to inherit the earth, until the children of Israel become as numerous as the stars in the sky, or the sand upon the sea shore -- Wherefore we beseech all that have ears to hear, or eyes to see, to beware! For God, at all times, when he was about to visit the children of men for their wickedness, hath sent angels, or prophets, to warn them of what was about to take place. As before the flood he sent Enoch and Noah: before the destruction of Sodom and Gomorrah, two angels; before he took Israel out of Egypt, Moses and Aaron, and so down to the coming of our Savior; And can less be expected before the great day of the Lord? Will God neglect to blow the trumpet in Zion, and sound an alarm in his holy mountain; or refuse to pour out his Spirit upon all flesh that will serve him in truth, before the wicked shall be turned into hell, with all the nations that forget him? No; Heaven and earth shall pass away but not a jot or tittle of his word shall ever fail. Therefore, in the fear of him, and to spread the truth among all nations, kindreds, tongues and people, this paper is sent that a wicked world may know that Jesus Christ, the Redeemer who shall come to Zion, will soon appear, unto them who look for him, the second time without sin unto salvation, to make a full end of all nations, whither he hath driven Israel, but will not make a full end of him, because he cometh to make restitution of all things which he hath spoken by the mouths of all his holy prophets since the world began. The Book of Mormon, having already gone to world, being the fulness of the gospel to the Gentiles according to the promises of old, we know that the blessing of Joseph is near at hand. For his glory, the firstling of his bullock, and his horns, the horns of unicorns; with them he shall push the people together from the ends of the earth, to the place of the name of the Lord of hosts, the mount of Zion: For in this mountain shall the Lord of hosts make unto all people a feast of fat things, a feast of wines on the lees, of fat things full of marrow, of wines on the lees well refined. And he will destroy in this mountain the face of the covering cast over all people, and the veil that is spread over all nations: wherefore it is now made known and published to the world, by the authority of the beloved Savior, that the gathering of the house of Israel hath commenced upon the land of Zion; and that the church which is called the church of Christ, is an ensign to all nations, that the children of God are returning from their long dispersion, to possess the land of their inheritance, and reign with Christ a thousand years, while Satan is bound. We know there are many lying spirits abroad in the earth, to withstand the truth and deceive the people, but he cannot be called a disciple of the humble Jesus who doth not know the language of God from the language of man. The Savior declares: He that will not believe my words, will not believe me, that I am: and he that will not believe me, will not believe the Father which sent me. For behold, I am the Father, I am the light, and the life, and the truth of the world. Come unto me, O ye Gentiles, and I will show unto you the greater things, the knowledge which is hid up because of unbelief. Come unto me, O ye house of Israel, and it shall be made manifest unto you, how great things the Father hath laid up for you from the foundation of the world; and it hath not come unto you, because of unbelief. Behold, when ye shall rend that veil of unbelief which doth cause you to remain in your awful state of wickedness, and hardness of heart, and blindness of mind, and then shall the great and marvelous things which have been hid up from the foundation of the world from you; yea, when ye shall call upon the Father in my name, with a broken heart and a contrite spirit, then shall ye know that the Father hath remembered the covenant which he made unto your fathers, O house of Israel; and then shall my revelations which I have caused to be written by my servant John, be unfolded in the eyes of the people. Remember when ye see these things, ye shall know that the time is at hand that they shall be made manifest in very deed; and those endowed with power from on high shall do miracles by faith, and signs shall follow them that believe, until the Son of man cometh in the clouds of Heaven with power and great glory. To a man of God, who looks upon the world as it now is, with nation against nation; kingdom against kingdom; rumor against rumor; revolution against revolution; war against war; robber against robber; persecutor against persecutor; sharper against sharper; society against society; sect against sect; and one against another over the face of the earth -- the fear of judgment will rest upon him, and while he is silent as heaven, he will hear the groans of eternity over the corruption of the world, and, with a thrill of compassion which might jar the earth from the sides to the center, he will watch the angels receive the great command -- Go reap down the earth! The Evening and Morning Star, besides the secret of the Lord, which is now with them that fear him, and the everlasting gospel, which must go to all nations, before the Holy One shall stand upon the mount of Olivet, and upon the mighty ocean, even the great deep, and upon the islands of the sea, and upon the land of Zion, to destroy the wicked with the brightness of his coming -- will also contain whatever of truth or information that can benefit the saints of God, temporally as well as spiritually, in these last days, whether in prose or poetry, without interfering with politics, broils, or the gainsayings of the world. While some may say this paper is opposed to all combinations under whatever plausible character, others will know, that it is for an eternal union whose maker and supporter is God; thus all may be as they are, inasmuch as they that plow iniquity, and sow wickedness reap the same -- but Wisdom is justified of her children. From this Press also, may be expected as soon as wisdom directs, many sacred records, which have slept for ages. ==> Terms. -- The Star will be issued monthly on a royal. sheet quarto, at $1 a year, till it shall be deemed proper to publish it oftener. (A supplement will be published weekly, if required, containing the advertisements of Jackson county, &c.) Letters to the editor must be paid -- and subscriptions in specie or United States' bills. W. W. PHELPS. Vol. V. Canandaigua, N. Y., July 11, 1832. No. 11. "THE EVENING AND MORNING STAR," a Mormon paper published at Independence (Missouri,) by W. W. Phelps & Co. has been received at this office. Note: This notice of the Evening & Morning Star is strangely brief. Perhaps the editorial staff at the Phoenix were embarrassed by their old comrade W. W. Phelps' conversion to Mormonism. Vol. III. Lyons, Wednesday, November 7, 1832. No. 6. I certify that in the year 1828 I was appointed Marshal of the Court Marshal of the 39th regiment of Infantry, of which Col. Ambrose Salisbury was President. That, as such, I received from the court a warrant, directing me to collect certain fines of certain persons therein mentioned, for military delinquencies. I also received a warrant to collect similar fines, which had been issued the year before, and partly collected, with directions to collect the balances due. By virtue of these warrants, I levied on property of several persons, in the town of Macedon, and advertised it for sale, according to law. Among others, I levied on the property of Jonathan Hoag, to satisfy a military fine which had been imposed on him in the year 1828. There was no fine charged against him in the warrant of 1827. That on the day of sale, I requested Col. Salisbury to accompany me to the place of sale, and he did so. There was a considerable amount of property advertised and sold, besides the property of Jonathan Hoag, on that occasion, but not any was bid off by Col. Salisbury except Hoag's and he bid that off unwillingly. Several other persons present bid for Hoag's corn, and, after it was struck off to Mr. Salisbury, he offered his bid to any person who would take it. He also consulted with Mr. Hoag, and urged him to arrange the matter, and save his corn, after it was bid off, stating to him that he did not want it. There were several persons present, and Col. Salisbury's bid for the corn was the highest made. I further certify that by virtue of the same warrant of 1828, I arrested several individuals, against whom military fines were charged, in that warrant, for want of property whereon to levy, residing in the town of Farmington, and took them in custody to Canandaigua with a view of committing them to jail. When we arrived in Canandaigua, they were taken from my custody, by virtue of a writ of Habeas Corpus, issued by Judge Howell, and they were taken before him, where J. C. Spencer Esq. appeared in their behalf, and after a long argument, they were remanded to my custody, by the decision of Judge Howell, and I committed them to the custody of the Jailer. LYMAN COWDERY. Dated Palmyra, Nov. 2, 1832. Note: Lyman Cowdery, Esq. was one of Oliver Cowdery's older brothers. At this point in time he was living near Newark, in Arcadia township, Wayne county, NY, where he served as a lawyer, a constable, a marshal, and a minor judge of the County Court. It seems unrealistic to suppose that Lyman would have agreed to abandon this line of work to become a school teacher in Manchester township, Ontario County, for the 1828-29 winter term. However, it is indeed possible that Lyman used his social and political contacts in the Palmyra area to arrange for his brother, Oliver Cowdery, to be employed in that position during that period. Vol. X. Palmyra, N. Y., Wed., December 8, 1832. No. 12. One of the Mormonite clergymen at Marietta, (Ohio,) has given out that he is the Comet, which has so long been calculated upon; and that, at a proper season he shall take occasion to blaze out. Vol. III. Lyons, Wednesday, March 27, 1833. No. 26. Note: Lyman Cowdery, Esq. was one of Oliver Cowdery's older brothers. At this point in time he was still living near Newark, in Arcadia township, Wayne county, NY. Vol. X. Palmyra, N. Y., Wednesday, May 8, 1833. No. 34. The Small Pox has broken out among the Mormonites at Jamestown, Chautauque co. They believe that their faith in the Mormon creed will save them from death and prevent the disease from spreading, and consequently refuse the aid of medicine and mingle with the people, thus subjecting others to this lothesome disease. This is worse than the hanging of the Salem witches, and shows the sloth of the boasted march of intellect in overstepping such of the superstitions of men as pretend to be of Divine origin. -- Penn-Yan Democrat. Vol. III. Lyons, Wednesday, May 15, 1833. No. 33. UNKNOWN LANGUAGES. -- The sect of Mormons in this region, have an addition to their "signs and wonders." The new gift consists in a general qualification of the members of the society to speak and prophecy in "unknown tongues" while under the influence of the Spirit. Their unknown dialects are occasionally introduced into exhortations &c., with much force and eloquence, though not much to the edification of the audience, who invariably stand in need of an interpreter conversant with every mode of speech since the confounding of languages at the Tower of Babel. A delightful euphony of sound is represented as running thro' the unknown languages of even the most illiterate speakers, and some beautiful specimens of alliteration have been listened to, every word in the address beginning with the same letter. It is said the members of the society instruct each other in the use of the gift, and perfect the pronunciation of the unknown [tongue] under the tuition of the Spirit. Since the general exhibition of this new sign, the society has been gradually increasing in numbers. -- Ohio Atlas. Vol. XXIV. Geneva, Wednesday, May 22, 1833. No. 51. INDIAN TRADITIONS. -- A correspondent has been sojourning among the Indians of the Upper Missouri, after some reservation, adopts the opinion that the natives of North America are descendants of the Jews. -- Writing from Mandan Village -- the settlement of an ancient tribe -- he says" "They have some traditional knowledge of the deluge, of the appearance and death of Christ, and the transgressions of mother Eve;" and relates several of their superstitions, which really seem to be corruptions of the Bible history. It is probable the writer will, on his return, give us the result of his observations and researches, in a more methodical form. Vol. III. Geneva, Wednesday, July 3, 1833. No. 131. "And now I testify to you, before God and these witnesses, that I never had any impressions or exercises different from other times, since I joined the Mormons; that the tongues spoken by me are of my own invention, and that, as far as my knowledge extends, the whole is a farce; and may my fate be like that of Annanias and Sapphira if I do not speak the truth honestly before God!" Note: See the June 4, 1833 issue of the Westfield American Eagle for this story. Vol. X. Palmyra, N. Y., Friday, August 16, 1833. No. 48. Mormonism in the Far West. -- The Pioneer, printed at Rock Spring, Illinois, under date of April 26th, contains a long account of that modern sect of fanatics, the Mormonites. Making due allowance for the editor of the Pioneer, for it is evident that he is an alarmist, there is no doubt that Mormonism is rapidly spreading in certain districts. He states that there are between 2 and 300 Mormon preachers in the field; that so far as they preach from our bible, their doctrine is sound; that they maintain with great force the truth of their new Bible, (the book of Mormon,) they rail against missionaries, and preachers of the gospel who work for pay; and positively affirm that the present generation will not pass away, before all the human family, who do not obey God will be destroyed, and Mount Zion in America, (on the western borders of Missouri,) and Jerusalem in Palestine, are gathering together. The government of the new ecclesiastical combination, is thoroughly despotic. It assumes to control property, personal service and the mind. Several thousand in Missouri, and Illinois, have already adopted the Mormon creed. In Jackson co., Missouri, there are one thousand. -- Cincinnati Chronicle. Note 1: Dr. John M. Peck's Rock Spring Pioneer later became the Louisville Western Pioneer and Baptist Standard-Bearer. 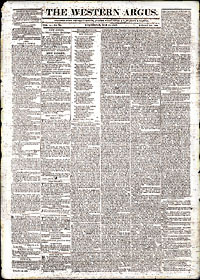 The issue of April 26, 1833 is not extant, but a series of articles Peck ran on the Mormons that same year may be partly preserved in reprints in other newspapers. One Pioneer article on the Mormons (from May 1832) was preserved in the pages of the Painesville Telegraph; another (from March 1835) may be found reprinted in the Exter, NH, Christian Journal. Note 2: In an early June, 1839 issue of the Western Pioneer and Baptist Standard-Bearer, Dr. Peck says: "It is evident -- and that we published in 1833, and again in 1835 -- that Solomon Spaulding wrote the main portion of the Book of Mormon as a wild, historical romance; but portions of that book were written by Cowdery, or some of Joe Smith's cronies.... In 1833 we wrote a series of articles, which were published [in] a little tract, at our own expense, and circulated in Illinois to expose the delusions of Mormonism..." This Peck pamphlet -- which evidently predated E. D. Howe's 1834 anti-Mormon book -- has survived as a single copy in the St. Louis Mercantile Library. See also Peck's 1854 article on the Mormons in Arthur's Home Magazine. N.S. No. 51. - Vol. I. Canandaigua, Weds., August 21, 1833. No. 277. HEAD QUARTERS OF MORMONISM BROKEN UP. "Lexington, Missouri, July 25, 1833. "You have probably heard of the Mormon edtablishment in this vicinity. Six hundred or more, of that misguided people, have emigrated within the last two years to Jackson city, in the next county to this, and have rendered themselves obnoxious to the citizens by holding out inducements for free negroes to settle in the county, and urging slaves to be unfaithful. last week the citizens organized themselves for the purpose of breaking up the establishment. Their (the Mormonite) printing press was torn down -- store and machine shop broken up -- the leaders tarred and feathered -- and a time set for their departure. What course may be pursued towards the followers, is not yet known." Vol. X. Palmyra, N. Y., Friday, August 23, 1833. No. 49. "You have probably heard of the Mormon establishment in this vicinity. Six hundred or more, of that misguided people, have emigrated within the last two years to Jackson city, in the next county to this, and have rendered themselves obnoxious to the citizens by holding out inducements for free negroes to settle in the county, and urging slaves to be unfaithful. last week the citizens organized themselves for the purpose of breaking up the establishment. Their (the Mormonite) printing press was torn down -- store and machine shop broken up -- the leaders tarred and feathered -- and a time set for their departure. What course may be pursued towards the followers, is not yet known." Vol. XXV. Geneva, Wednesday, Sept. 4, 1833. No. 14. MORMONISM. -- As this sect of fanatics had its origin in this neighborhood, the following information will be interesting to our readers. The printing press which was torn down, was conducted by Mr. Phelps, late of the Ontario Phenix, and him who boasted thar he had led the Antimasons of Ontario county thrice on to victory! a worthy leader in such a cause! HEAD-QUARTERS OF MORMONISM BROKEN UP. Lexington, Missouri, July 15, 1833. You have probably heard of the Mormon establishment in this vicinity. Six hundred or more, of that misguided people, have emigrated within the last two years to Jackson county, (in the next county to this,) and have rendered themselves obnoxious to the citizens, by holding out inducements for free negroes to settle in the country, and urging salves to be unfaithful. Last week the citizens organized themselves for the purpose of breaking up the establishment. Their (the Mormonite) printing press was torn down; -- store and machine shop broken up, -- the leaders tarred and feathered, and a time set for their departure. What course may be pursued towards the followers, is not yet known. N.S. No. 3. - Vol. I. Canandaigua, Weds., September 4, 1833. No. 279. Vol. X. Palmyra, N. Y., Fri., September 6, 1833. No. 51. Some days since, says the N. Y. Journal of Commerce, we announced to our readers, by means of a letter from Missouri, that the Mormonite head quarters in Jackson county, in that state, had been broken up. The St. Louis Republican of the 9th inst. just received, gives the annexed particulars of the transaction. We can easily conceive that such an establishment would be quite a nuisance any where; but we must say, notwithstanding, that such a mode of breaking it up is illegal and riotous, however respectable may have been the individuals concerned. What avail our toleration principles, if no sect is to be endured but such as are free from extravagance and fanaticism? "1. That no Mormon in future move and shall settle in this county. "2. That those now there, who shall give a definite pledge of their intention within a reasonable time to remove out of the county, shall be allowed to remain unmolested until they have sufficient time to sell their property and close their business without any material sacrifice. "3. That the editor of the 'Star' be required forthwith to close his office, and discontinue the business of printing in this county; and also all other stores and shops belonging to the sect, their owners must in every case strictly comply with the terms of the second article of this declaration, and upon failure, prompt and efficient measures will be taken to close the same. "4. That the Mormon leaders here, are required to use their influence in preventing any further emigration of their distant brethren to this county, and to counsel and advise their brethren here to comply with the above requisitions. "5. That those who fail to comply with these requisitions, be referred to those of their brethren who have the gifts of divination, and unknown tongues, to inform them of the lot that awaits them. Which address being read and considered was unanimously adopted. And thereupon it was resolved that a committe of twelve be appointed forthwith to wait on the Mormon leaders and see that the foregoing ewquisitions are strictly complied with by them; and upon their refusal that said committee do, as the organ of this county, inform that it is our unwavering purpose and fixed determination, after the fullest consideration of all the consequences and responsibilities under which we act, to use such means as shall insure their full and complete adoption, and that said committee, so far as may be within their power, report to this present meeting. And the following gentlemen were named as said committee: Robert Johnson, James Campbell, Col, Moses Wilson, Joel F. Chiles, Hon. Richard Fristoe, Abner F. Staples, Gar[y] Johnson, Lewis Franklin, Russel Hicks, Esq., Col. S. D. Lucas, Thomas Wilson, and James M. Hunter, to whom was added Col. R. Simpson, Chairman. And after and adjournment of two hours, the meeting again convened & the committee of twelve reported that they gad called on Mr. Phelps the editor of the "Star," Edward Partridge, the bishop of the sect, and Mr. Gilbert the keeper of the Lord's storehouse & some others & that they declined giving any direct answer to the requisitions made of them, and wished an unreasonable time for consultation, not only with their brethren here, but in Ohio. Whereupon it was unanimously resolved by the meeting that the "Star" printing office should be razed to the ground, the type and press secured, which resolution was, with the utmost order & decency & the least noise or disturbance possible, forthwith, carried into execution, as also some other steps of a similar tendency; but no blood was spilled nor any blows inflicted. The meeting then adjourned till the 23d inst., to meet again to know further concerning the determination of the Mormons. The citizens again convened on the 23d day of July, 1833, which was composed of gentlemen from all parts of the county, and much more unanimousely attended than the meeting on the 20th instant. "Memorandum of agreement between the undersigned of the Mormon society in Jackson county Missouri, and a committee appointed by a public meeting of the citizens of said county, made the 23d day of July, 1833. "That Oliver Cowdery, W. W. Phelps, Wm. McClealand, Edward Partridge, Lyman Wight, Simeon Carter, Peter and John Whitmer, and Harvey Whitlock, shall remove with their families out of this county, on or before the first day of January next; and that they, as well as the two hereinafter named, use all their influence to induce all the brethren now here to remove as soon as possible -- one half, say, by the first of January next, and all by the first day of April next. To advise and try all means in their power to stop any more of their sect from moving to this county; and as to those now on the road, they will use their influence to prevent their settling permanently in the county, but that they shall only make arrangements for temporary shelter, till a new location is agreed on for the society. John Carrol and Algernon Gilbert are allowed to remain as general agents to wind up the business of the society, so long as necessity shall require; and said Gilbert may sell out his merchandise now on hand, but is to make no new importation. "The 'Star' is not again to be published, nor a press set up by any of the society in this county. "If the said Edward Partridge and W. W. Phelps move their families by the first day of January, as aforesaid, that they themselves will be allowed to go and come in order to transact and wind up their business. "The committee pledge themselves to use all their influence to prevent any violence being used so as long as a compliance with the foregoing terms is observed by the parties concerned; to which agreement is subscribed the names of the above named committee, as also those of the Mormon brethren named in the report as having been present." The report of the committee was unanimously adopted by the meeting and it was then adjourned. Vol. III. Lyons, Wednesday, September 25, 1833. No. 52. Two Mormon preachers have been holding forth in Andover, Me., from the Mormon Book, and baptized nine persons, formerly members of the Free Will Baptist Church. -- Bath. Enq. Vol. XI. Palmyra, N. Y., Friday, November 15, 1833. No. 9. The Mormonites. -- The Sacco (Me.) Republican says that the Mormonites have recently made many converts in that town. Some of its most respectable citizens have embraced the faith, and are exerting their influence to extend and advance, as they say, "the greatest light that ever yet dawned upon the mysteries of an awful eternity." Note: Sacco, Maine was the general location in which the early prophet and polygamist, Jacob Cochran, established his unique sect. N.S. No. 14. - Vol. I. Canandaigua, Weds., Dec. 4, 1833. No. 292. Civil War in Jackson County. Vol. XI. - No. 12. Palmyra, N. Y., Fri., Dec. 6, 1833. Whole 532. THE MORMONITES -- Civil War and Bloodshed. -- A letter from Josiah Jones, esq. of Kirtland, Ohio, (the head quarters of Mormonism in that state,) to Doct. P. Hurlbert, now at this place as a missionary in behalf of the people of Kirtland for the purpose of investigating the origin of the Mormon sect -- which it is known first appeared in this neighborhood -- mentions some recent disturbances between the citizens and Mormonites at Independence, Jackson co. Missouri, in which some twenty or thirty persons were killed. This account is corroborated by a statement from Mr. Orson Hyde, an eye-witness, and a leader among the Mormonites, published originally in the St. Louis Republican of the 12th ult. From the statement of Mr. Hyde, (and perhaps some allowance should be made for partiality to his own party,) it appears -- as we find the story abridged in the Albany Argus -- that on the night of Oct. 31st, some forty or fifty of the citizens of Jackson co. made an assault upon the Mormonite village, and demolished twelve dwelling houses. Two of the Mormonites were taken and severely beaten and stoned. On the following night, the attack was renewed by the same mob, who broke open Gilbert and Whitney's store and scattered their goods through the streets. On Saturday night, another assault was made, but the Mormons, in the mean time, had conveyed their goods to a place of safety, and prepared themselves for defence. They were fired upon by the mob, and returned the fire, by which two men were wounded. On Monday, the mob had increased to between two and three hundred men, well armed, who called themselves the Militia. They again attacked the settlement, and poured a deadly fire upon the settlers, several of whom were killed. A party of the Mormons returned the fire, with a fatal effect. Some twenty or thirty of the assailants fell, mortally wounded; among them Hugh L. Bronzeale and Mr. Hicks, attorneys at law. The writer, after this battle, left the settlement to wait upon the governor, to petition for a redress of these grievances. The issue of the application is not stated. The letter above mentioned adds that among the persons arrested and lodged in jail to await the claims of justice, is the renowned Phelps, late editor of the Ontario Phoenix. Note 1: Josiah Jones, Esq. was a Gentile Justice of the Peace in Kirtland township, Geauga county, Ohio. He is supposed to have been one of the primary leaders of the 1833-34 Northern Ohio, Anti-Mormon "Committee" who helped finance D. P. Hurlbut's research efforts in New York and Massachusetts. See his 1831 "History of the Mormonites" in Ohio, as published in the June 1, 1841 issue of the Rev. Walter Scott's Evangelist. Note 2: Although this article does not relate the details of Mr. Jones' letter to D. P. Hurlbut, it is likely that he wrote to urge the Anti-Mormon "missionary" to hasten back to Kirtland and take advantage of the LDS leaders' recent serious set-backs in Missouri -- which provided an unexpected weakness for exploitation by their opponents in Ohio. Hurlbut left Palmyra for Ohio about a week after this article was published in the Sentinel. Vol. XXV. Geneva, Wednesday, Dec. 11, 1833. No. 28. Mormon War. -- The inhabitants of Jackson county, Missouri, on the night of Oct. 31st, made an assault upon the Mormonite village and demolished 12 houses, and beat and stoned some of that sect. The assault was repeated two subsequent nights. The Mormons prepared themselves with fire-arms to resist the violence of the mob, which under the name of Militia had increased to near 400. A fierce attack was made on the Mormon settlement, and a deadly fire poured in which killed several of the Mormons. -- The latter returned the fire with fatal effect. Some twenty or thirty of the assailants fell, mortally wounded; among them Hugh L. Bronzeale and Mr. Hicks, Attorneys at Law. This is civil war indeed, and when suppressed, it is hoped that a salutary example will be made of the offenders. -- Buffalo Rep.
Vol. XXV. Geneva, Wednesday, Dec. 18, 1833. No. 29. The Disturbances in Jackson County. -- We are glad to receive more pacific accounts from the county of Jackson. The Mormonites have determined to oppose no further armed resistance to the dominent party, and they were rapidly leaving the county and their homes, with intention of forming another community elsewhere. They are determined, however, to prosecute the citizens engaged in hostilities toward them, and for the depredations committed upon their property. They have undoubtedly adopted the best course which was left to them; and all alarm has subsided in that county. All our accounts concur in one thing, that the original statement as to the number killed, was much exaggerated. The most authentic and latest account which has reached us, puts down the number at 6 -- 2 of the citizens, and 4 of the Mormonites, and a good many wounded. Vol. III. Geneva, Wednesday, Dec. 18, 1833. No. 155. The war against the Mormonites in Missouri intermits, according to the St. Louis Republican of the 22d ult. not, however, by reason of the law having interposed to protect individual rights, but because "the Mormonites have determined to resist no more and were rapidly leaving their country and their homes." ! The previous accounts as to the number killed were exaggerated; the latest and most authentic statement puts the number at six, two citizens and four Mormonites. A good many, however, were wounded. Vol. XI. - No. 14. Palmyra, N. Y., Fri., December 20, 1833. Whole 584. The Mormon mystery developed. -- Doct. P. Hurlbert, of Kirtland, Ohio, who has been engaged for some time in different parts of this state, but chiefly in this neighborhood, on behalf of his fellow-townsmen, in the pursuit of facts and information concerning the origin and design of the Book of Mormon, which, to the surprise of all in this region who know the character of the leaders in the bungling imposition, seems already to have gained multitudes of believers in various parts of the country, requests us to say, that he has succeeded in accomplishing the object of his mission, and that an authentic history of the whole affair will shortly be given to the public. The original manuscript of the Book was written some thirty years since, by a respectable clergyman, now deceased, whose name we are not permitted to give. It was designed to be published as a romance, but the author died soon after it was written; and hence the plan failed. The pretended religious character of the work has been superadded by some more modern hand -- believed to be the notorious Rigdon. These particulars have been derived by Dr. Hurlbert from the widow of the author of the original manuscript. Note 1: Doctor Philastus Hurlbut evidently left the above news release with the Editor of the Wayne Sentinel on or about Dec. 12, 1833. The Editor found space for the report in his issue of the following week (on Dec. 20, 1833). By the time the report was published, Hurlbut was well on his way back to Ohio. Once he had returned to the Kirtland area, in the last days of December, 1833, Hurlbut reportedly made public display of some Solomon Spalding mansucript writings, and it was perhaps at that time that he first publicized the supposed connection of "the notorious Rigdon" with the Spalding authorship claims for the Book of Mormon. Strangely, Hurlbut seems to have made no attempt to solicit statements mentioning Rigdon's alleged pre-1830 interaction with Joseph Smith, Jr. Note 2: Hurlbut's Palmyra news release does not give the name of the "respectable clergyman" who wrote the "original manuscript" of the Book of Mormon, but subsequent reports made in Geauga Co., Ohio would identify the author as Solomon Spalding, a former Congregational Evangelist, who died in 1816. As for Hurlbut's claim to have accomplished "the object of his mission;" that accomplishment was apparently his securing the originals to Solomon Spalding's extant writings from the home of Mr. Jerome Clark in Hartwick, new York. At about this same time Hurlbut wrote to Solomon Spalding's widow, informing her that he had taken possession of her late husband's "Manuscript Found." Although several Kirtland area witnesses later reported that Hurlbut had exhibited that particular manuscript of Spalding's, both in private and public meetings, D. P. Hurlbut eventually went on the record as denying that he ever obtained such a work of fiction from the Clark residence. 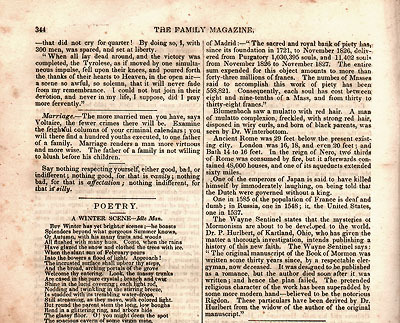 Note 3: Hurlbut's news release was reprinted by several different Northern newspapers, but the piece is known to have received national distribution only in the pages of an early 1834 issue of the Family Magazine. See the bound volume reprint of that periodical for 1833-34 for the publication of Hurlbut's notice (on page 344, reproduction at bottom of second column, below). N.S. No. 17. - Vol. I. Canandaigua, Weds., Dec. 25, 1833. No. 295.